The #FunnyNotFunny thing about Landrieu is that not only are the wages of her political sin going to be death in the runoff next month, but the way she’d so cheerfully promise to prostitute herself and her state in order to stay in office. We can say, “Well, that’s politics” and shrug, but at some point one has to hope Mary gets to recover a bit of dignity. An incumbent who has been reduced to a Meatloaf reference is not worth keeping. Politics and harlotry. The two go together in the DimoKKKrap Party. Don’t forget thowing destructive tantrums when there is any chance their long term legislative agenda is compromised. Although the picture of her is funny, considering what the Democrat party stands for, she should really be wearing Pennywise or Joker makeup…. She would do anything for love, such as living in her parents’ basement. It’s good that the family stays together like that. Alas! Would that the GOP were harlotry-free, but we are not . . . as the other Senator from Louisiana so ably demonstrated. Both parties are full of horsetheives and prostitutes. There’s something about politics that attracts the worst in humanity. Those two were both evil and intelligent. Landrieu is simply rotten and clever, like a rat. She’s actually more attractive in the clown makeup. It does sort of walk back the Miss Piggy thing. That commie pig never had any dignity. If offering sexual favors to random drunks on Bourbon Street could keep her in office Mary Landrieu would be there right now. Somehow I’m guessing they’d be IOUs to be carried out by the taxpayers. Also, the bums might feel better about the health implications that way. It is called power. It is a matter of degree. The more power is diluted from any one individual, the safer we become. Absolute power corrupts absolutely. I lOL’ed. Then I was embarrassed that I LOL’ed. Which made me LOL even more. Time for some eggnog! Power doesn’t corrupt people. People corrupt power. Partially true. The personalities that are most prone to corruption are drawn to power like moths to a flame. 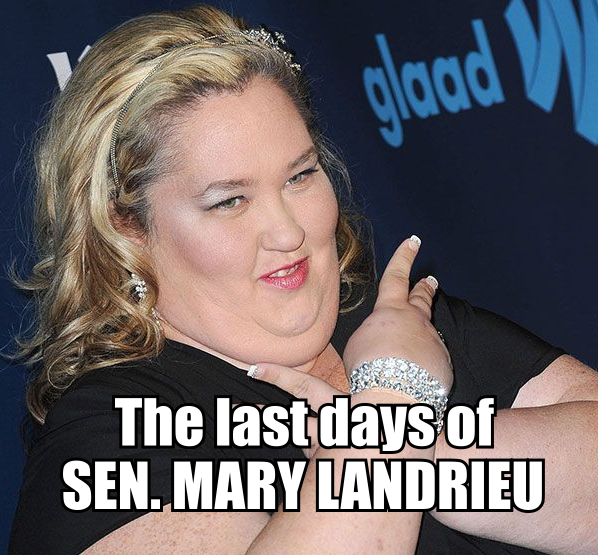 Landrieu is a horrible Senator and not much of a human being, but she is hardly unusual in her quest for pork. Every Democratic Senator who ever attained seniority in the postwar era demanded pork tribute for his vote. Our own Trent Lott was a GOP master. The Bridge to Nowhere was a Republican project. Portsmouth, NH Naval Base, closed by ice three months every year, survived base closings over Charleston’s higher efficiency and quality ratings because Maine’s George Mitchell was Senate Majority Leader. The $14 billion – and growing! – ‘Big Dig’ tunnel is Tip O’Neill’s living legacy. The truth of the matter is this sort of horse-trading is inevitable in parliamentary democracy. Congress passed the first pork-laden bill in 1817, although it did not override Madison’s veto. It is one of the prices we pay for representative democracy, which should never be confused with a perfect system. I suspect that originally the quid pro quo was mostly pork swaps similar to old fashion graft in the old city political machines. Earmarks are actually the correct way for congress to designate spending for individual projects, as without those mandates, and particularly with CRs replacing budgets all that money simply becomes a slush fund for the administration. Unfortunately earmarks became simply bribes to not read the legislation as it became more about selling out our liberties and useless programs about make believe caring. It’s not really clear what difference it makes, or how political power exists in a stand-alone form. Lack of accountability is what corrupts. The less of it the more corruption you get. Power generally leads to less accountability. Political power can’t exist in ”a stand -alone form” it is always wielded by humans and therefore modified by human nature. That’s why the American Revolution was the last successful revolution. The founders accepted human nature as they found it. That’s why they designed political power to compartmentalized. Relying on the virtues and vices of our natures to create a balance. Every other revolution since has relied on changing human nature to create their perfect (see fools errand) societies. Heck, I’d vote Bill Cosby over Landrieu. There are earmarks, and then there are earmarks. If an earmark just specifies how money is to be spent, and goes through the normal budget and appropriations process, it is a useful tool and eliminating that tool was a mistake. The ‘bad’ earmarks are those which are slipped in either after a bill is marked up in committee or in conference, where it avoids scrutiny and is therefore ripe for abuse and corruption. These were the favored tools of lobbyists – and of Ron Paul, one of the biggest hypocrites to ever darken the halls of Congress. Construction and maintenance of naval bases is a federal function. Intrametropolitan transportation arteries are certainly not something the federal government needs to involve itself. Neither are rural bridgeworks which connect point A to point B within a given state. -Sadly, we have come to embrace more Vices and less Virtues, so the equilibrium has become deranged and we find ourselves far down The Road To Serfdom – with, perhaps, not enough fuel to turnaround and get back Home.